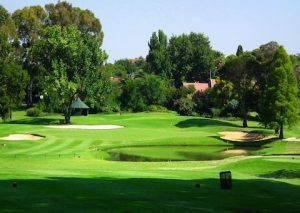 Conveniently located within 10 minutes of OR Tambo International Airport, Glendower Golf Course is a well designed 6770m course, situated against a tree-covered slope. The fairways are excellent, featuring numerous hazards and narrowing at the greens. Water comes into play on 11 of the holes. The aesthetically pleasing second hole is one of the best par-fives to be found anywhere, requiring an accurate tee-shot to a fairway flanked by trouble both left and right and a water hazard next to the green. Magnificent greens, an abundance of bunkers and luscious Kikuyu fairways complete your experience. Enjoy playing a round at Glendower Golf Course during your golf holiday in South Africa.